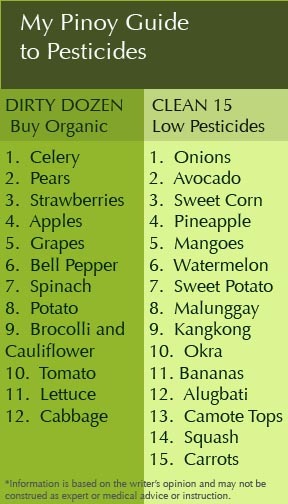 I have been hankering for a Philippine Dirty Dozen and Clean 15. There are vegetables and fruits that have made it to the American Clean 15 list, but shouldn’t be in ours. Their fruits and vegetables grow in a temperate climate with four distinct seasons. Our fruits and vegetables are not too lucky. We have no distinct wet and dry, and have the rains and humidity to contend with. There are just certain temperate fruits and vegetables that do not grow in this climate. And these fruits and vegetables are able to thrive, only when doused with pesticides and fungicides. Among these are cabbages and asparagus. 1. Fruits or vegetables that are temperate can only be grown in high elevations in the Philippines. These elevations have more rain, and thus require more fungicides to thrive. 2. You are better off, as always, eating what is endemic or indigenous to the Philippines, and in season. 3. Also, determine whether your fruits or vegetables are grown in the ground. Those grown in the ground would have the most pesticides. Those that grow in trees would have lower levels. 4. Fruits or vegetables with thick outer layers can be washed and/or peeled, and prepared properly to lessen the pesticide levels. Below is a list I came up with (with a little help from our farmers). I took into account the fruits and vegetables that make it into the Filipino cuisine. 7. Spinach- You’re better off eating Gabby Leaves or Malunggay (plants endemic to the Philippines.) Spinach is a ground-hugger like lettuce and drinks in pesticides through its stalks. 8. Potatoes- Again, they just grow above the ground so farmers use chemicals to make sure they can harvest potatoes. Pesticides are also ingested through the potato’s thin skin. 9. Broccoli/Cauliflower- If you live in temperate zones, these would have low pesticide levels. However, these vegetables only grow in cold weather, and if grown elsewhere (i.e. tropics), would need fungicides to thrive during the rainy months. Higher elevations would have more rainfall. Most of the broccoli we get here are grown at higher than 700 meters and these entail over a 100 inches of rain a year. 10. Tomatoes- Prone to bacterial wilt and pesticides, which in temperate climate, eases during the winter. In tropical zones, has to be sprayed to thrive. 11. Lettuce- Ease up on your salads or go organic. Lettuce stay in the ground and bulk up on pesticide laden water. They have a high pesticide load. If you can’t spend extra, reduce your exposure by removing the outer layers. 12. Cabbage- In temperate zones, these would have low pesticide levels. In our climate, cabbages suffer from diamond black moth infestations and are sprayed with pesticides. CLEAN 15 When it’s ok to scrimp. 5. Mangoes- tough skin & grows high. BUT be sure though that these are in season when you buy them. Otherwise, the mangoes have been grown using flowering enhancers. Taken in part: Environmental Working Group; Chensheng Lu, Emory University’s School of Public Health; United Fresh Produce Association and The Environmental Working Group’s Shopper’s Guide to Pesticides.